Most mothers, after having delivered their bundle of joy, notice some repercussions of the birth process to their skin. Some may think you just have to live with this “new normal” way that your skin has begun to look. However, there are many great treatments that can take your skin, and particularly your tummy, back to the way it used to be before you gave birth. HIFU skin tightening is a revolutionary skin tightening treatment, which can work wonders on tightening and lifted the common ‘mummy tummy’ so many women face after having children. After pregnancy, the skin surrounding the stomach area tends to lose some of its elasticity. 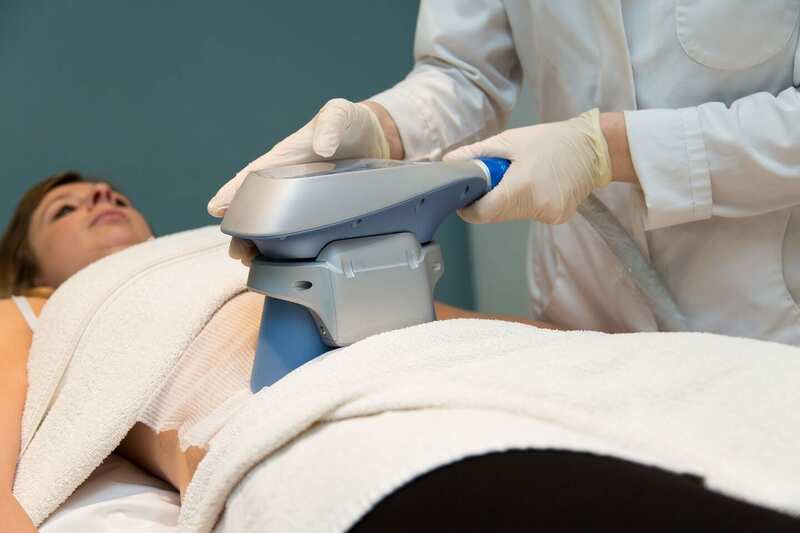 HIFU skin tightening, using Ultraformer technology, tightens loose skin on the stomach, thighs, and just under the buttocks. The applicator is placed along your problem area(s) and the ultrasound energy from the applicator destroys fat cells, whilst your body stimulates new collagen production. The outcome is smooth and restored skin in just under an hour and with minimal pain involved. Stretch marks after the birth of a child can be hard to deal with. There might seem like there’s just no way to get rid of them. But, you needn’t worry anymore, as we have two great treatments that can help to reduce stretch marks. Using either the INFINI™ 3D Skin Tightening therapy or our micro-needling treatment Dermapen we can help to restore your skin to how it looked pre-pregnancy. With the combined therapies used in the INFINI™ treatment, you will see maximum results with minimal downtime afterwards. It uses 3D technology and micro-needling to get the fullest degree of benefits for your skin. Tiny micro-holes are made with tiny needle tips that are precisely placed to let in the radio frequencies needed to stimulate collagen and elastin production. This precision ensures your skin’s dermis (second layer) is not damaged in any way. With the Dermapen, micro skin needling has been revolutionised for safe, more effective, and less painful results. It makes maneuvering across the skin easier and is able to get more accurate penetration to the points in your skin that will make the most difference. Also, if you have scar tissue where the micro needle should be placed, the Dermapen can easily penetrate those skin cells through it’s vertical delivery system. A special note to mothers: the majority of these procedures cannot be performed while breastfeeding. We take the overall health of our patients very seriously. When you are ready to seek treatment, we will be right here with the latest innovative technologies to help.